Another story from the Mahabharata. Today my story is even older than the story of Abhimanyu (https://unrepentantlyrecalcitrant.wordpress.com/2013/10/02/the-story-of-abhimanyu-why-you-must-have-an-exit-strategy/). It’s a story from the childhood of Arjuna, Abhimanyu’s father. 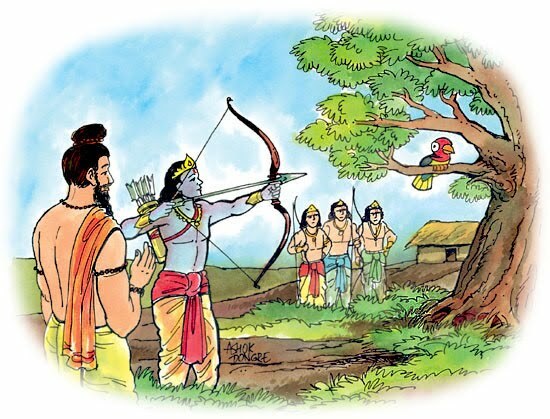 Arjuna, a warrior prince, and his brothers and cousins are being trained in archery and warcraft by the great teacher Drona. Drona assembles the young princes together, places a wooden sparrow on the branch of a tree and asks the princes to aim for the eye of the bird. “What else do you see?” asks the venerable teacher. “Tell me everything you see”. “I see the sky, the clouds, the sun..Oh Drona” responds the prince. Drona then asks the next prince in line the same question. One by one the princes are asked the same question and they describe everything they see. “What do you see boy?” asks Drona. “Blackness, my teacher. I see blackness”. And he was. The best archer in the world. A warrior without equal. Look for this in your lives my dear readers. Look for the blackness in the eye of the sparrow. See nothing else, do nothing else, dream nothing else. Perfect this and you will be perfect at what you do. Let me tell you the story of Abhimanyu. Long long ago in a kingdom far far away, an epic battle was fought. The battle and its larger story were immortalized in an epic Sanskrit poem called “The Mahabharata”. The war was between two families of cousins battling for control of their kingdom. Abhimanyu, a warrior prince learnt the strategies of war while in his mothers womb. His overheard his father Arjuna telling his mother Subhadra how to enter, exit and destroy various battle formations. The most complex of these battle formations was the “Chakravyuh”, a formation resembling a rotating spiral that moved forward and expanded at the same time. Here is where the story gets interesting (and relevant, so pay attention!). Subhadra, listening to her husband teach, fell asleep before he finished. Abhimanyu, learnt the method of entry into the Chakravyuh, the way to fight once inside, but did not hear how he should exit. Fast forward to the battle, many years later. The bad guys (sic) are winning. Things look grim. The Chakravyuh is advancing on Abhimnayu and his forces. It seems unstoppable. Abhimanyu, hero that he is, rushes forward and uses his knowledge to penetrate the spiral. He breaks his way in and fights the enemy from the inside. Alas, he does not know how to get out of the spiral, once he is in. He lacks an exit strategy. He is surrounded and killed by the enemy forces, and dies a bloody death on the battlefield. I think I’ve made my point to all of you here (and It isn’t that you shouldn’t fall asleep in class!). Whatever you do, entrepreneurship or investing or anything else with meaning to you, consider your exit strategy. Not an exit strategy, not even a couple. You should be devising a decision tree of exits based on your view of multiple different outcomes for your task. While your life may not depend on it as it did for our hero, you should behave as if it does. Your outcome(s) will thank you. As a coda for readers interested in the Mahabharata, it is the longest Indian poem (the title means Great Indian Story), is available in English translation and is one of the most gripping tales ever told. The Bhagavad Gita, a discourse by Lord Krishna is a story within this story and probably better known. In the Gita, Krishna speaks to Arjuna (Abhimanyu’s father) and explains right living and the concept of “Karma”. Try it. You will love it.